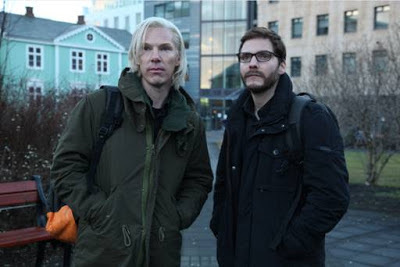 Have you heard of Dreamworks Studios' latest project, The Fifth Estate? The Fifth Estate is a WikiLeaks drama. For those of you who don't know, WikiLeaks is an online site that publishes top secret information, news leaks and more. It is a way for people to submit sources of information, while staying anonymous. "The Fifth Estate" follows Daniel Domscheit-Berg, an early supporter and eventual colleague of Julian Assange, through the early days of WikiLeaks. Since I explained the site to you or if you already knew of the site, you can only imagine the type of controversial and history changing information leaks that were and still are being released by the site today. Due to the website’s success, the people behind it all found instant fame and changed the way information was revealed to news media and everyone who had access to the internet. This drama directed by Bill Condon ("The Twilight Saga: Breaking Dawn") will open in theaters November 15, 2013 and star Benedict Cumberbatch as Julian Assange and Daniel Brühl as Daniel Domscheit-Berg. Other stars include Laura Linney, Anthony Mackie, David Thewlis, Peter Capaldi, Dan Stevens, Alicia Vikander and Carice van Houten. Will you be watching? This will be definitely be a movie filled with controversy and drama!